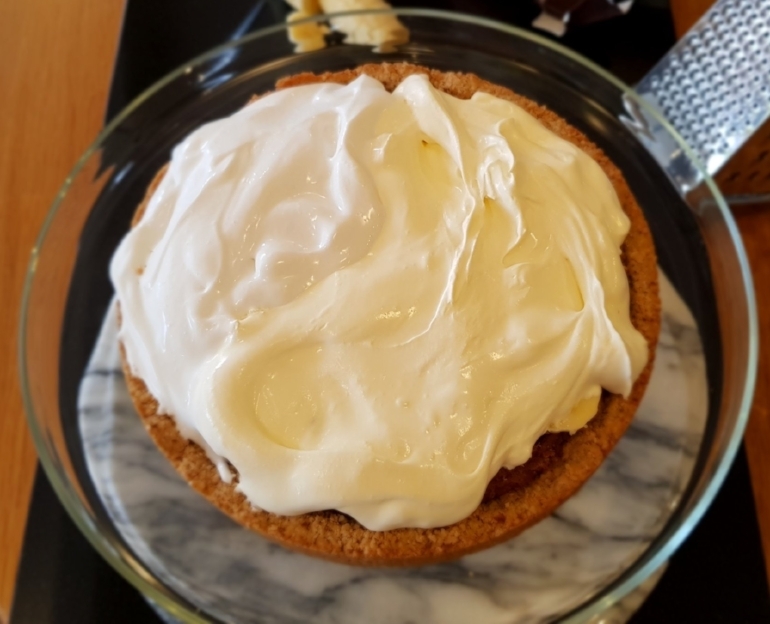 i found this recipe online when i was looking for a tasty dessert to make and take to my auntie and uncle's house for a family sunday meal. i wanted something that everyone would enjoy, wouldn't be thought of as "too healthy" or put people off by being vegan. 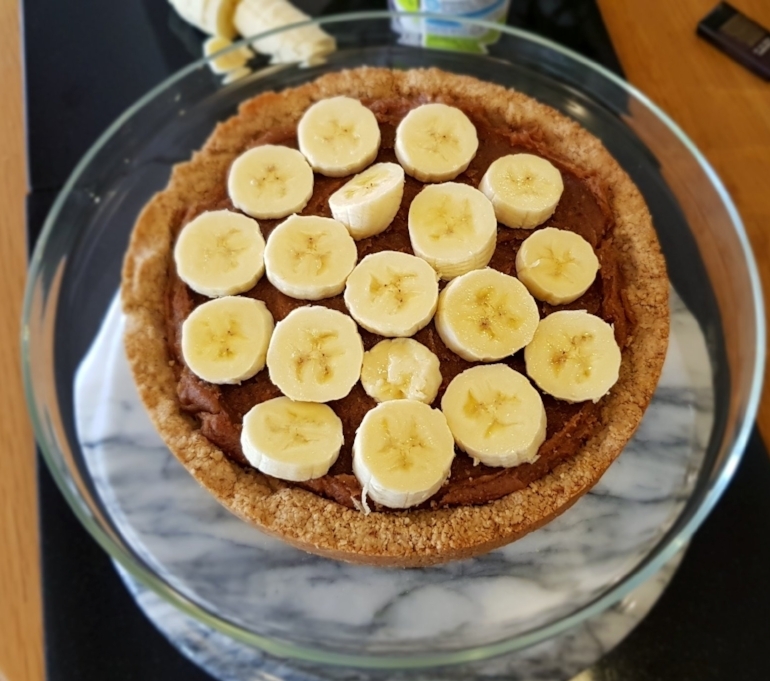 it was perfect, everyone loved it and no one knew it was dairy-free, gluten-free or vegan, so it was a winner! the downside is that there are lots of ingredients and it is not cheap to buy them all. be mindful of this as my poor mum spent time and money going around 3 different shops to get all the ingredients that we needed. disclaimer - this is not my recipe and the words in the method are mostly copied. i took it from a recipe on calipress.co.au, which I found via 'the feed feed'; an excellent website for anyone needing some cooking inspiration! 3 tablespoons (45 mL) smooth almond butter - I USED MERIDIAN BUT YOU CAN MAKE YOUR OWN HERE IF YOU HAVE MORE TIME! 1. if you cannot afford to, or you don't have a big m&S nearby to buy ready-made coconut cream, Place the 2 cans of full-fat coconut milk in the fridge overnight (or for at least 12 hours) to allow the coconut cream to solidify. 2. For the crust Preheat your oven to 190°C. Grab an 8 to 10-inch tart pan (I used a 7 inch as it's all i had and the base was too thick) and lightly grease the base and sides with coconut oil. Cut a circle of parchment paper to fit on the bottom and place it inside. This will prevent the crust from sticking. 3. Add the almonds into your food processor - you need a strong one - and process until they are the texture of coarse sand. Now add in the oats, cinnamon, and salt and process again until the coarse, sandy texture returns. 4. Add the melted oil, maple syrup, and water to the grainy mixture then process until the mixture comes together. The dough should stick together when pressed between your fingers; if it’s still too dry, try adding another teaspoon or two of water and process again. 5. Crumble the dough all over the base of the tart pan in an even layer. Starting at the centre, press the dough flat into the pan with your fingers and work your way outward and up the sides. If the dough starts to stick to your hands, lightly wet your fingers every now and then. With a fork, poke the base of the tart about 15 times to allow the air to escape while baking. 6. Bake the tart, uncovered, for 12 to 14 minutes until lightly golden. Remove from the oven and place the tart pan on a cooling rack for about 15 minutes. If the crust puffed up during baking, you can poke it a few more times with a fork to let the air escape. The crust will firm as it cools. 7. Meanwhile, make the Raw Caramel Toffee - if your dates are quite firm then put them into a bowl and pour boiling water over the top. Let them sit for 5 to 10 minutes then Drain and add them to the food processor along with the almond butter, lemon juice, salt, and vanilla bean seeds (if using). Process until smooth, stopping to scrape the bowl as needed. 8. Open the chilled cans of coconut milk and carefully skim off the white cream from the top of the can, discarding the water. Add the skimmed coconut cream to a medium bowl. With electric beaters, beat the cream until smooth and fluffy. cooked base with caramel toffee on top. my base was a bit too thick. 9. When the crust has cooled, gently spread all of the caramel toffee onto the base of the crust—using the back of a lightly wet spoon—until the base is covered. Slice all of the bananas. Place half of the banana slices on top of the caramel, pressing down lightly to adhere. 10. Spread all of the whipped coconut cream on top of the banana slices in an even layer. 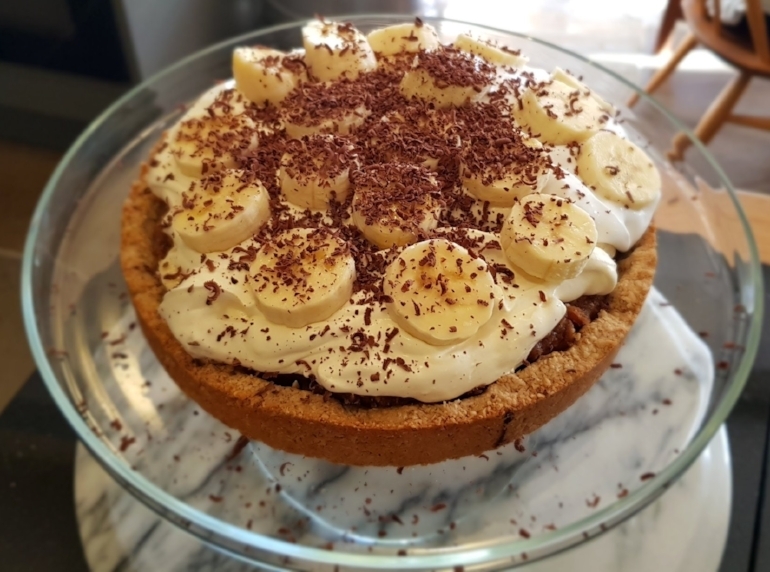 Now place the remaining banana slices on top of the pie in a circular pattern, overlapping and stacking them to create height. as you can see, i used 1/3 coconut cream and 2/3 double cream for the fam! 11. Garnish with shaved chocolate and serve immediately. Leftovers will keep in the fridge in a sealed container for up to 3 to 5 days. We don’t recommend freezing this pie, as the banana slices get mushy after thawing. so, there you have it! it actually only takes about 1 hour to put together and is really wonderful as a treat for a special occasion. i hope you enjoy and if you make it, let me know what you think!